A glass type which has a refractive index of 1.85 and Abbe number of 25 and realizes low partial dispersion ratio PgF in the same area as FDS90, is effective for correcting chromatic aberration. It has better transmittance characteristics than FDS90-SG, and it can be used for wide applications such as interchangeable lenses. The transmittance characteristics of TAFD 55 (nd = 2.00100, νd = 29.13) exceeding the refractive index nd = 2.0 have been greatly improved. Characteristics other than transmittance are the same as for TAFD55. 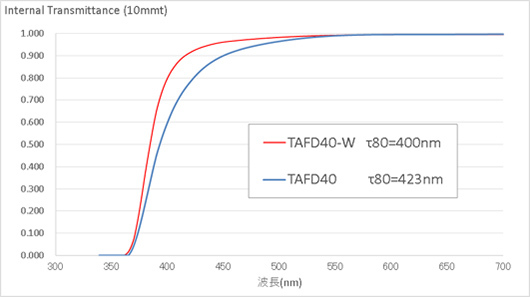 The transmittance characteristics of TAFD 40 (nd = 2.00069, νd = 25.46) exceeding the refractive index nd = 2.0 have been greatly improved. Characteristics other than transmittance are the same as for TAFD40. Due to server problems, you might have difficulty getting access to our website during the period below. We apologize for any inconvenience caused by this server problems. We have already solved the problems, been running it as usual. If anyone who contacted us in the period and not have any response yet, please contact us again. We apologize for any inconvenience caused by this development. FDS20-W achieved high dispersion(vd=20.02) more than FDS90(vd=23.78) without decline of spectral transmission. Because FDS20-W has a property of low density(Specific Gravity=3.37), contribution to the weight saving of lens can be expected. In production of non-spherical-power lens by mold press, last refractive index changes on annealing condition. Amount of refractive index change depending on wavelengths is different, it is indicated by catalog data of βC, βd, βF, βg. For your information, annealing condition of MC-glass type and result of constants of dispersion formula and estimated residual stress birefringence are indicated. Residual stress birefringence was calculated using following formula. →Excel file of reference information can be downloaded here. It is a glass with an extremely high partial dispersion ratio (PgF = 0.555) in the νd = 60 area, which have no abnormal dispersion material so far. 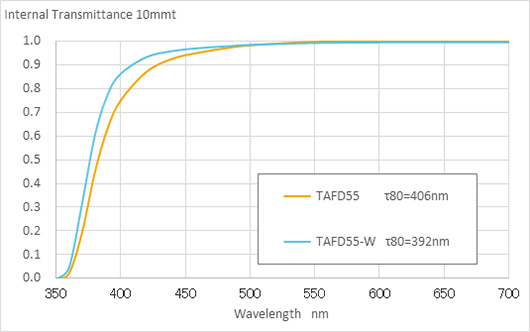 And in near infrared spectrum, FCD600 also shows unprecedented partial dispersion ratio and can be used for high-precision correction of chromatic aberration over a wide range of wavelengths. and with excellent transmittance and durability, it can be widely used in many fields. 2017 Sep. 15 We exhibited at CIOE 2017 (Shenzhen, China). The 19th China International Optoelectronic Expo 2010 was held at CIOE 2017 in Shenzhen, China from Wednesday, September 6th to Saturday, 9th. We highly appreciate all visitors who visited our booth. while exclude the component of Ta, become lighter and lower cost. high environmental resistance, could be widely use in various applications. Our NRP® was published in the Nihon Keizai Shimbun (Japan Economic News post) dated 21 July 2014. Our previous processing of lens material (RP, reheat-pressed product) was molded to a predetermined size that included a flap zone, has been used over the years for spherical glass lenses and was manufactured through the process of grinding and polishing. The NRP® process that we developed produces lens material shape accuracy improvement (three times higher precision of RP), surface defects less than 1/3 and thickness variation accuracy improvement (5 times over the current company standard) which could significantly reduce the allowance of polishing lens and reduce the processing fluctuation. For more information, please refer to the Contact Us on this site or contact our sales representatives by phone at +81-42-546-2520. 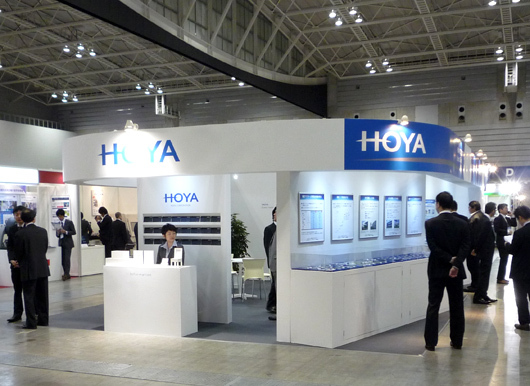 It should be noted that, "NRP" is a registered trademark of HOYA CORPORATION. 2012 May. 07 Arrival thanks "Lens Expo 2012"
Thanks for yours sincerely coming "Lens Expo 2012"Apr. 25th to 27th, 2012, in Pacifico Yokohama. 2012 Mar. 23 Attending "Lens Expo 2012"
And we are sincerely looking forward to your visiting. In the Expo, we would present our new series of cold processing preforms (MC-FCD500-20, MC-TAF31-15); improved spectral transmission with high dispersion optical glasses (FD60-W, NBFD15-W) and all kinds of aspheric lens use optical glasses, lens polishing use optical glasses. 2011 Sep. 12 Arrival thanks "The 13th China International Optoelectronic Expo". Thanks for yours sincerely coming from various countries and cities visiting our Sept 6th to 9th, 2011, in China International Optoelectronic Exposition(CIOE). We are looking forward to see you next year again. 2011 Jul. 06 "The 13th China International Optoelectronic Expo". The China International Optoelectronic Exposition (CIOE) is a worldwide renowned optoelectronic field exhibition. This year, the 13th CIOE would be held in Shenzhen Convention& Exhibition Center from September 6th to 9th , 2011 over a total exhibition area of 100,000 square meter. There would be almost 3000 worldwide exhibitors expected to attend. 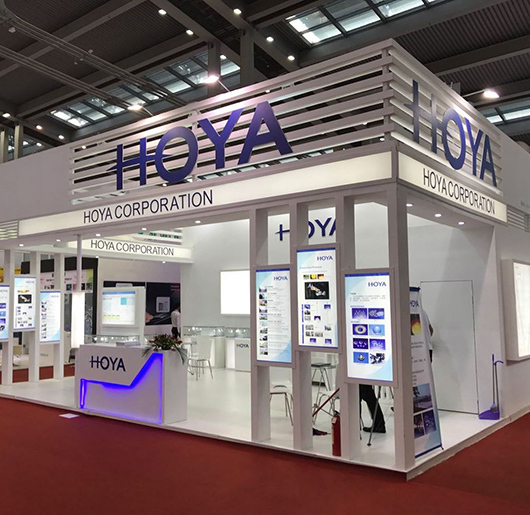 We, HOYA Group, are pleased to inform our dearest customers and whom may concerns that we will be attending this year to present our most advanced optoelectronic technologies and innovations in the show box 9331( 9th Entry spot), and we are looking forward to your visiting. The currently recommended glass FDS90, is widely use as a typical high refractive optical glass with high dispersion. However, this glass type has its specific coloration, many of our customers requested the improvement of its transmission. 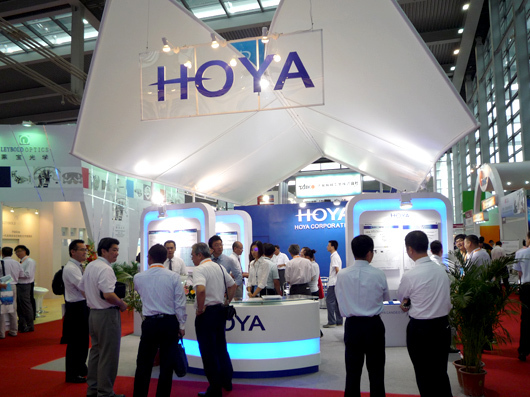 In order to response the request of our valuable customers, HOYA was devoted to investigate, and finally come to the result　of establishing the stablized production technology of the following high transmission optical glass. This product is positioned as a contribution to the high performance, high function and high quality of optical products. In addition, only transmission is changed, without any change of the composition of glass and raw material. Also, the price will be same as current FDS90. Please reference to the following PDF for the standard value of FDS90-SG and Premier νd standard. For further information of Premier νd standard of FDS90-SG, please visit "Consultation" of our website or contact the following operation branches. 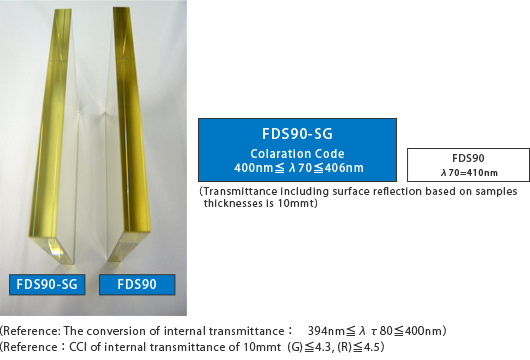 FCD100 is an extremely low dispersion optical glass equivalent to fluorite (CaF2). Relying on technological innovation, we have successfully launched the mass production of high-performance optical glass at the apex of the FCD family. Combining it with optical glass of high refractive index allows us to achieve unprecedented advanced chromatic aberration correction. 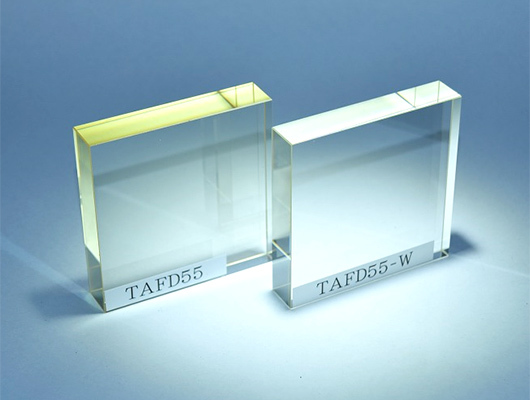 TAFD55 is an optical glass that achieves a high refractive index exceeding nd = 2.0 and boasts an Abbe number above νd = 29. Moreover, it limits the type of rare metal materials used to obtain maximum cost performance.It also exhibits outstanding spectral transmission, making it the best choice in lenses for high-performance digital products. 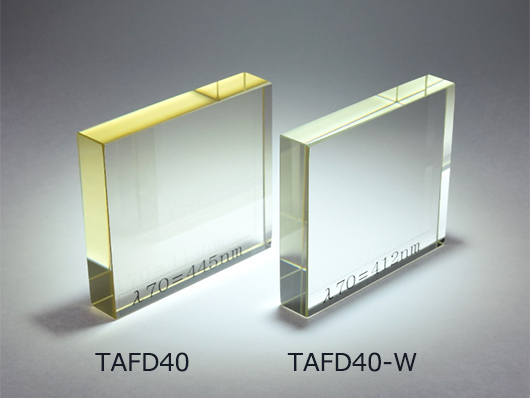 TAFD33 is a new high-performance optical glass, which enjoys a high refractive index that exceeds nd = 1.88 and an Abbe number over νd = 40. It achieves low cost by reducing the use of expensive rare metal materials. PCD51 is a low dispersion optical glass, featuring excellent chemical durability and low specific gravity.This is a high-performance glass especially suited for reducing optical weght. M-TAFD307 is a glass molding material　with a high refractive index made from M-TAFD305, which contributes greatly to high-power lens designs. Moreover, its Abbe number is equivalent to that for M-NBFD10, and it can also be used as a high refractive index glass. We are also able to provide aspheric lenses with the same quality as that of M-TAFD305. M-FDS1 is a glass molding material whose refractive index properties equal those of E-FDS1. With the use thereof, the number of choices for high refractive index and high dispersion aspheric lenses ranging between M-FDS2 and M-FDS910 has increased. This enables us to meet a wide variety of needs for high-power lenses. M-LAC8 and M-LAC14 were created to respond to the need for high-performance lens designs more efficient than those for M-LAC130. As a result, the current TAFD~TAC lineup of aspheric lenses featuring a high refractive index and low dispersion has been extended to the LAC series. MC-TAF1 is a glass molding material with a high refractive index and low dispersion, possessing refractive index properties corresponding to those of optical glass TAF1. Highly accurate pressing at low temperatures is possible since the glass transition temperature (Tg) of MC-TAF1 is substantially lower than that of TAF1. We have prepared the following list of glass preforms for precision molding (Precision Surface). The following glass types are used in the production of high-precision aspheric lenses. (Please take note that the preforms marked by the suffix □ □ □ have a different refractive index from the molded lens (MO) designated by the prefix (M-) in the catalogue. 2011 Mar. 24 “LENS EXPO 2011”. We will participate in the “LENS EXPO 2011” and you will be welcome to our booth. At this exhibition, we’ll introduce new members of the “H-series” optical glass types and low melting point glass. We will also present "Optical Glass materials (blanks for glass lenses, preforms for precision moldings)" and "Optical Lenses (aspherical, spherical)" adopting those new glass types.